My Perspective is not the only perspective: "The Broward Post", Chaz's New Venture Up and Running. Good Luck!! "The Broward Post", Chaz's New Venture Up and Running. Good Luck!! So Chaz Stevens has changed his My Acts of Seditions into a full blown investigative reporting news source The Broward Post, offering his stories to traditional news media free of charge. "Carrying forward the best traditions of American journalism, the Broward Post will be entirely non-partisan, non-ideological, and will adhere to a strict principle of impartiality. We won’t ally with politicians in charge or any advocacy groups. We will be persistent in our efforts, as long as there is a tale to be told, we will stay with it." The above is a direct quote from one of the first stories out the gate from Chaz's new venture. Personally, I agree with Chaz and having a news media outlet that will actually perform investigative journalism is something that this City, this County, this State, and this Country is in dire need of. A news media outlet to shine a light on political misdeeds that help to bankrupt the "public trust" in our government. Especially, if the investigative journalist does not have to answer to an Editor, stock holders, or any type of board that will exert their power to determine which stories need investigating and killing others, all with the "public interest" in mind. So, when I read the above statement I thought "Great, it's about time". 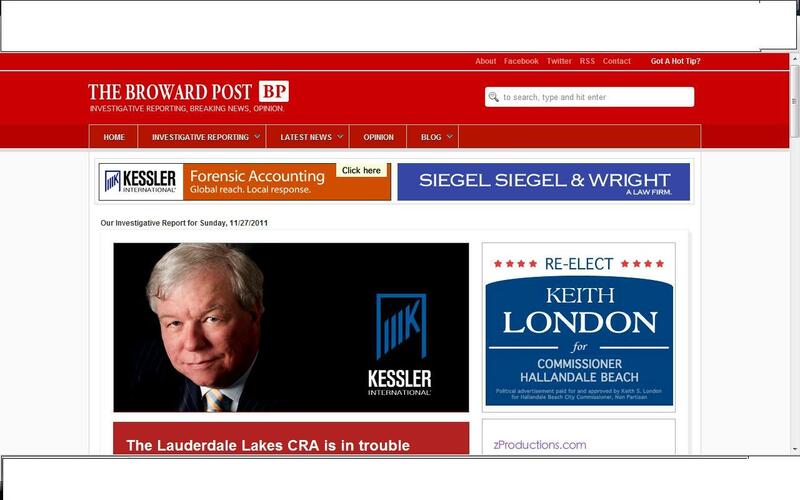 Then I noticed on the "HOME" page to the immediate right of the article was an ad indicating it as paid advertisement promoting the campaign to "Re-Elect Keith London", a current City Commissioner in Hallandale Beach. So, obviously I became a little leery of this because I had just read that this investigative news source would not "ally with politicians in charge". So an ad for Keith London, a politician seemingly in charge, is concerning. With City of Hallandale Beach Commissioner, Keith London, trying to erode the Council-Manager form of government in Hallandale Beach, which a post about it can be read here. I wonder what he thinks of the Commission-Manager form of government here in Deerfield Beach and if he were a Commissioner here in Deerfield Beach would he employ the same tactics to give our Commission the authority to question City Staff who felt their opinions and suggestions weren't adequately considered by our City Manager. Is Keith London the same Hallandale Beach Commissioner that drove all the way to Deerfield to speak on Chaz's behalf during the whole DBHA Commissioner Chaz Stevens debacle and the same Keith London who frequently commented on MyActsofSedition.com post and possibly provided Chaz with inside information about Hallandale Beach's Mayor, Joy Cooper. Then I looked at the other ads, which there were basically two for Kessler International. Which is the forensic auditors that Chaz admittedly suggested to the City of Deerfield Beach City Manager, Burgess Hanson, which found wrong-doing. That's not to say that any thing that the auditing team found should be disregarded as suspect, it is just pointing out that maybe there was a financial or other reason that this particular firm, who has a, well, you can say a spotty past in forensic auditing, at least the ratepayers of Cape Coral and the Cape Coral Daily Breeze think so, which the post can be read here. No one is suggesting that maybe Kessler International is "gun for hire" for politico's to root out their competition or get rid of dissenting commission/council votes that are hindering special projects. I wouldn't suggest such a thing, but that's not to say that it's not a possibility that an investigative reporter may find interesting enough to look into. All the cities that Kessler International has "audited", City Managers and certain politicians have handed specific cases with seemingly inside information pointing at specific departments and elected officials, creating conjecture, innuendo, suspicion, and blame sometimes while many times providing no proof to substantiate their claims. If Kessler is so good, why have they not audited an entire City, why only specific departments, when it would make more sense to audit entire city functions, especially if your goal is to root out corruption and the misuse of Federal funds and taxpayer dollars. It's not like the suspicion isn't there or that a real audit wouldn't serve the public trust!!! Oh, by-the-way didn't Kessler International honor Chaz Stevens with a reward award for all his hard work and dedication in fighting public corruption. Then there is an ad for none other than Chaz's best legal buddies, the law firm of "Siegal Siegal & Wright". We may all remember that Chaz's relationship with at least two individuals at this law firm (Silver, Wright & Siegel listed attorney's on previously posted legal documents) has helped him possibly commit legal stalking, blackmail, and possible extortion against some of his e-victims. Victims of Chaz's own brand of cyber-stalking and cyber-menacing can attest that these letters from an attorney, go a long way into helping to scare someone into submission even when you have done nothing wrong, but just wanting so desperately to make a menace go away, read post here. I guess if I ever have legal problems maybe I will contact them about utilizing their legal services, it's obvious they are brilliant attorneys because they have basically carved out their own niche of clients right here in Broward County, stalkers, cyber-stalkers, and those that commit cyber menacing acts like Chaz Stevens. Now, all of the above is not to say that the Broward Post won't help Broward County to root out corruption and other aspects of the political arena that help to bankrupt the public trust. It is to say that rooting sometimes, when done with a nefarious purpose only tills the soil making it easier for a more parasitic weed to take root. Is that really what Broward needs? Especially, since Broward seems to be becoming the hub for political corruption, starting at its northern most city, Deerfield Beach. So, Broward Post I would like to be one of the first Deerfield blogs to publicly wish you good luck and I hope that you utilize the platform that you have created to do good that actually benefits the people of Broward County and not just a self-serving mission that will only lead to the eventual total degradation of the public trust, that should be held so sacred by all. Go Get em' Broward Post!! !